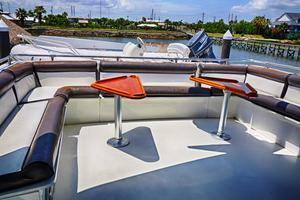 Beginning all the way aft is a fiberglass swim platform. 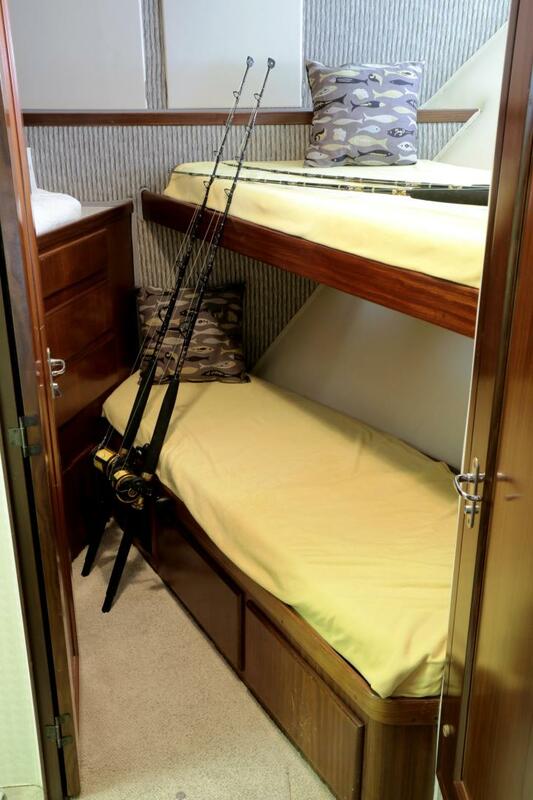 A walk-thru transom door w/ gate leads from here into the large custom fishing cockpit with fiberglass non-skid sole and a portable hot and cold fresh water shower wand. 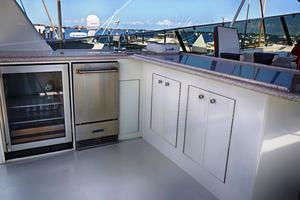 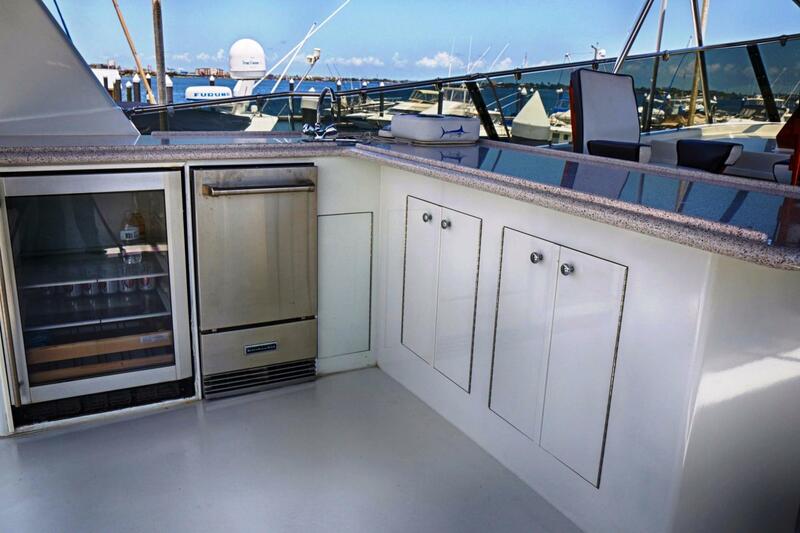 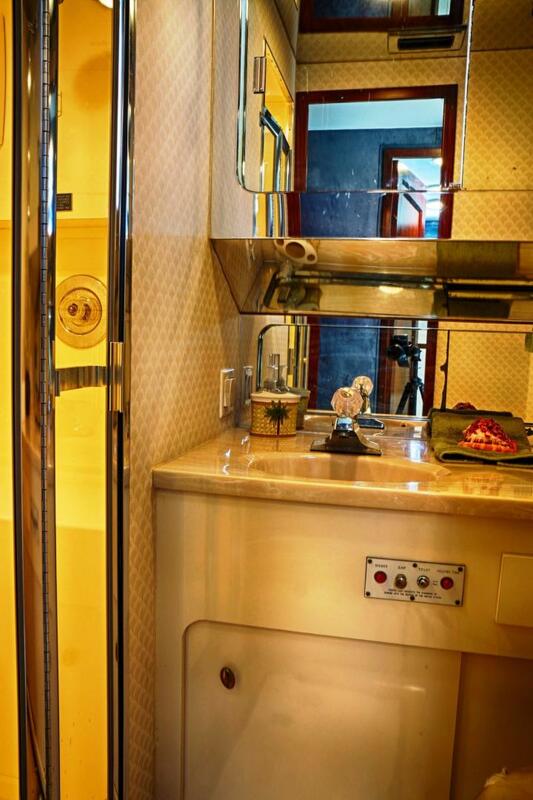 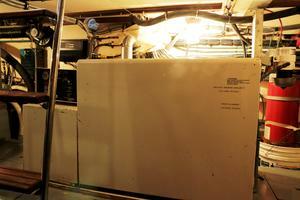 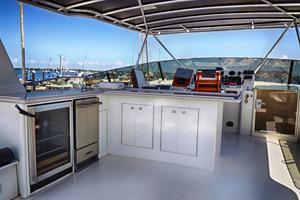 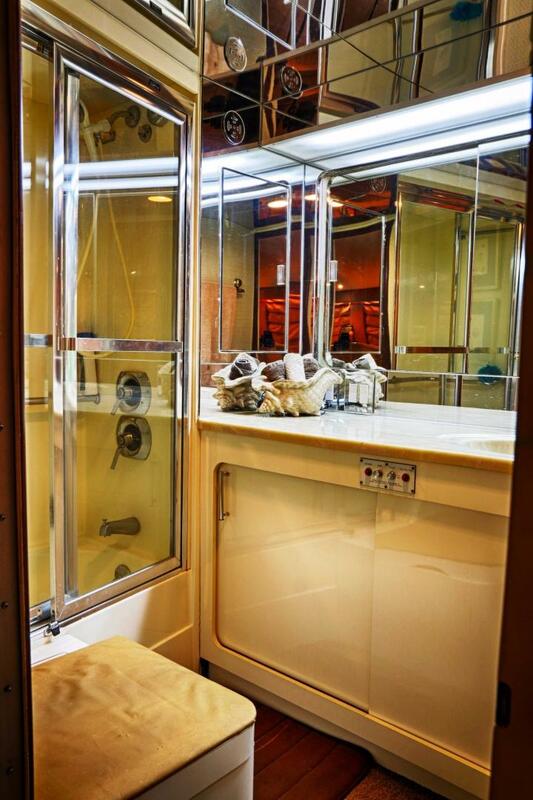 A Jenn aire 3-burner electric cook-top, 110V refrigerator, freezer and a sink are housed inside cabinets forward in this area and stairs on the center-line lead up and forward onto the aft-deck. 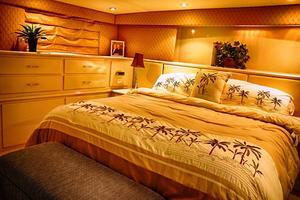 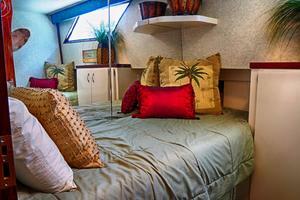 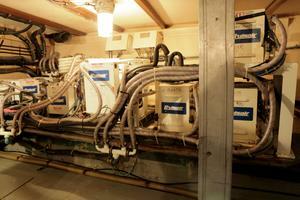 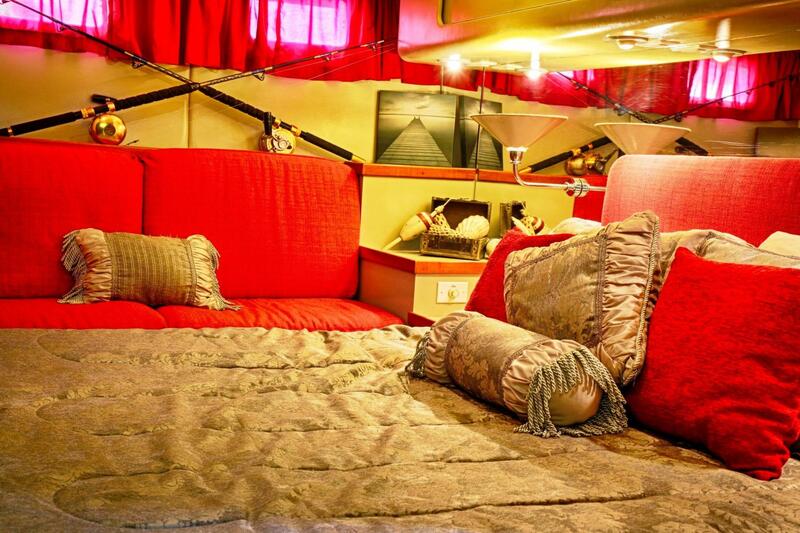 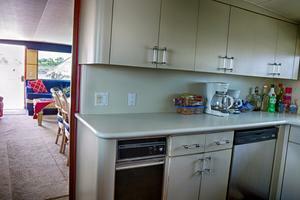 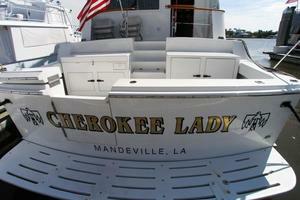 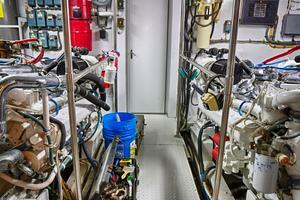 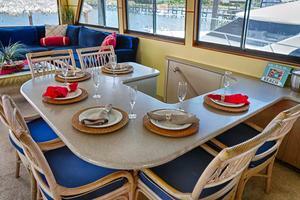 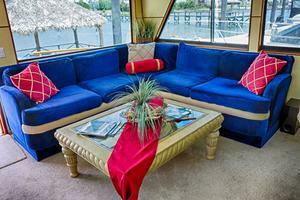 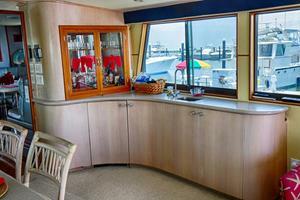 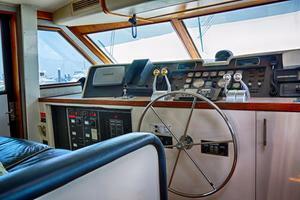 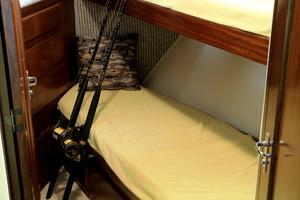 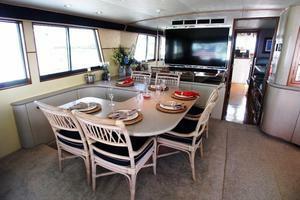 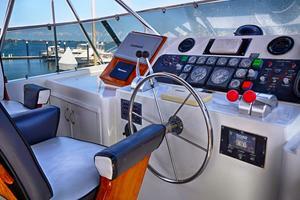 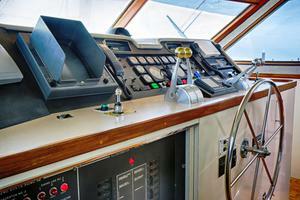 The aft-deck is mostly covered by the overhanging boat-deck above and large enough to accommodate 2 occasional chairs. 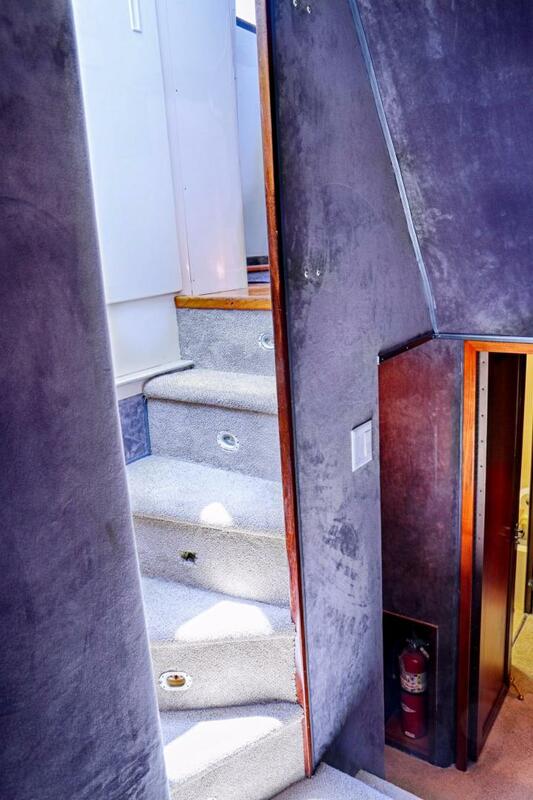 A door leads forward from here and into the wide and very spacious main salon. 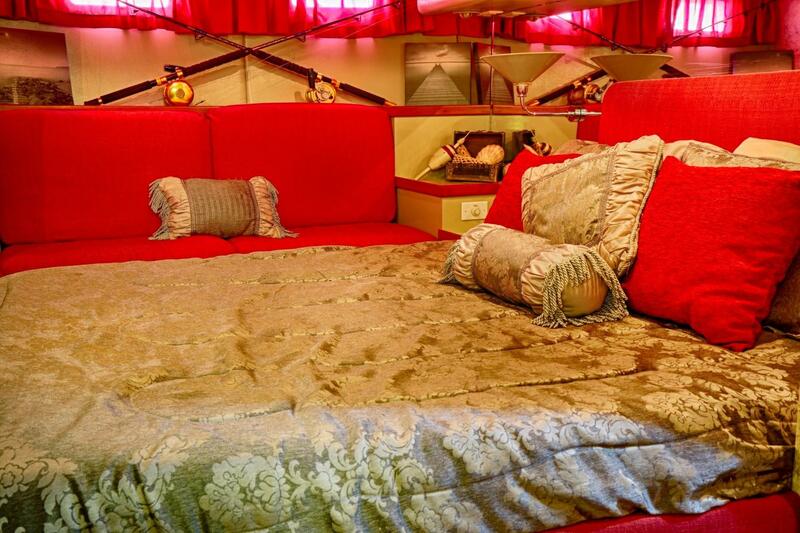 Upon entering the salon, a large, comfortable “L”- shaped settee with coffee table is immediately to port and two swiveling upholstered chairs are across to the starboard side. 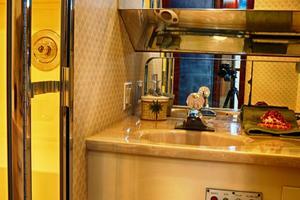 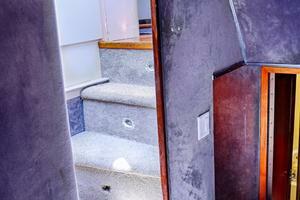 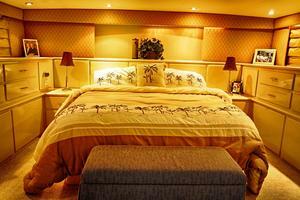 Forward on the port side is a stairway which leads down to the master’s stateroom and engine-room. 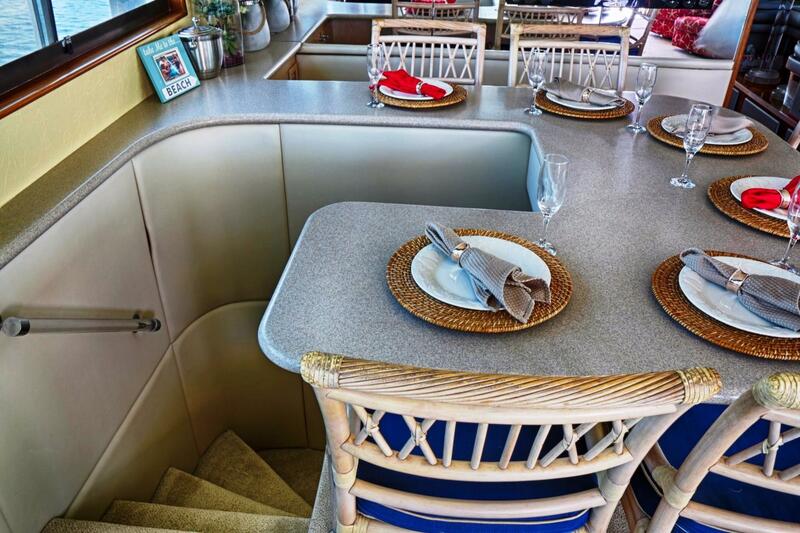 This stairway was custom built with a corian counter-top surrounding the well and accommodates six (6) persons for dining. 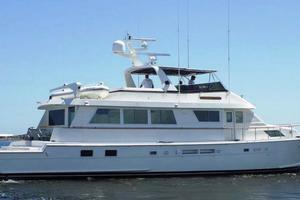 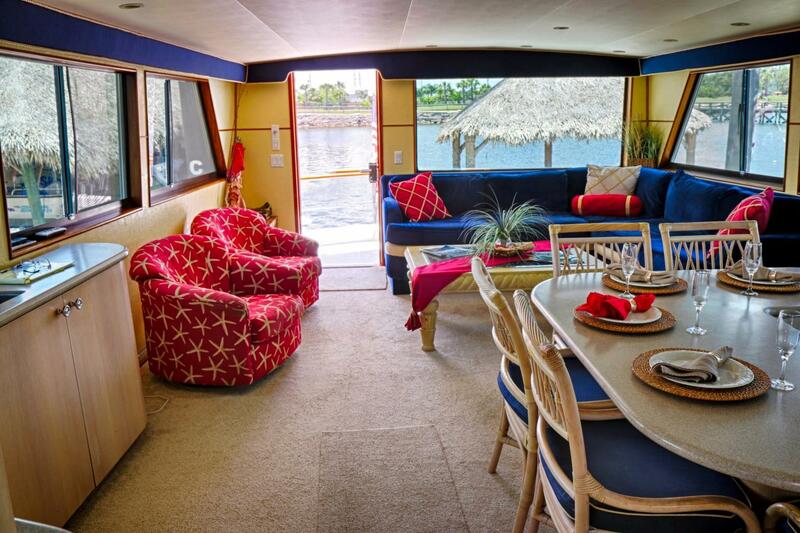 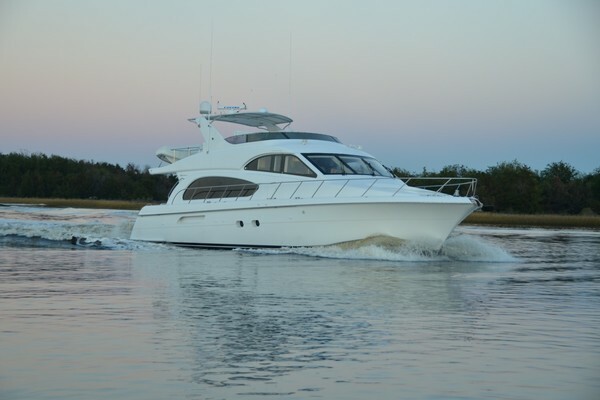 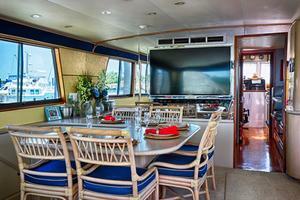 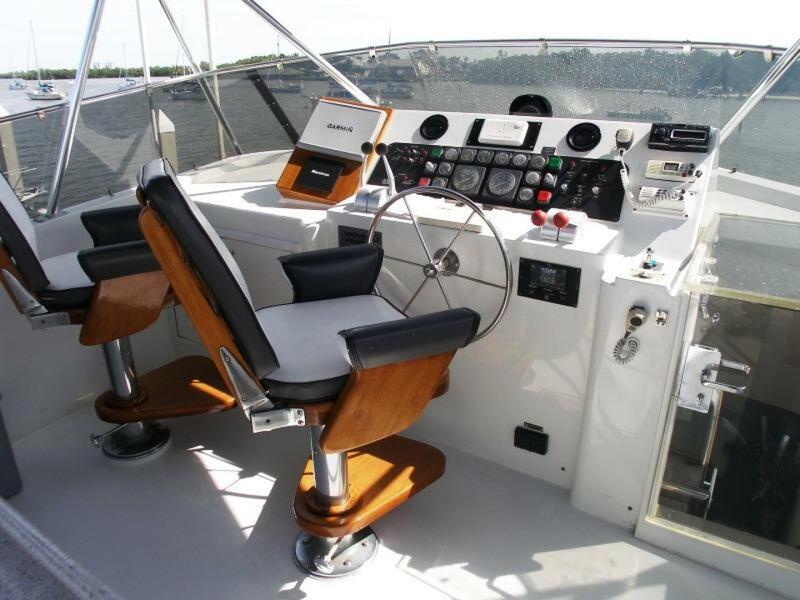 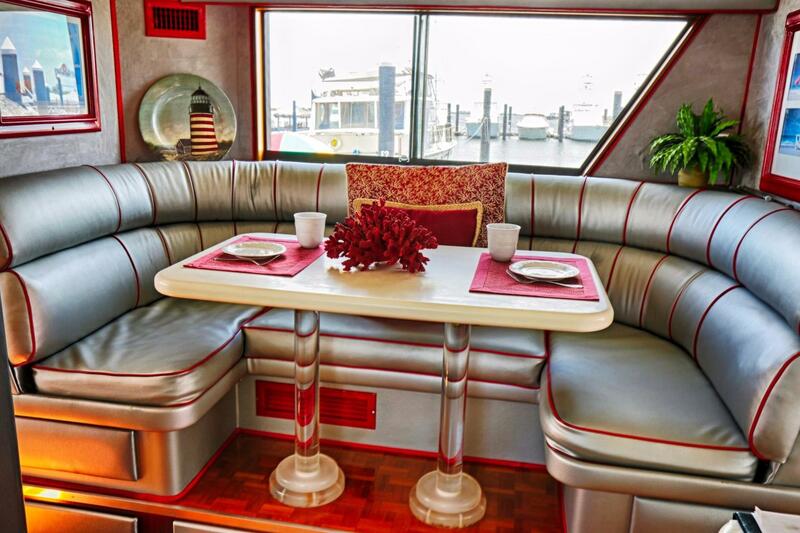 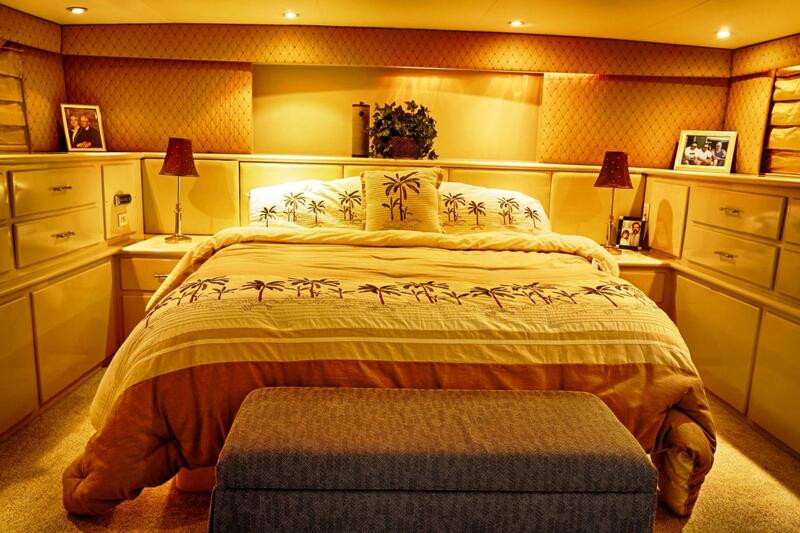 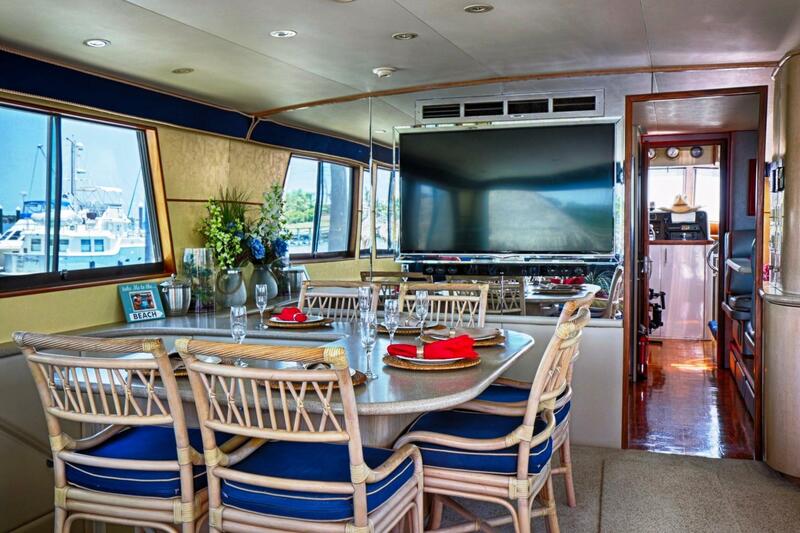 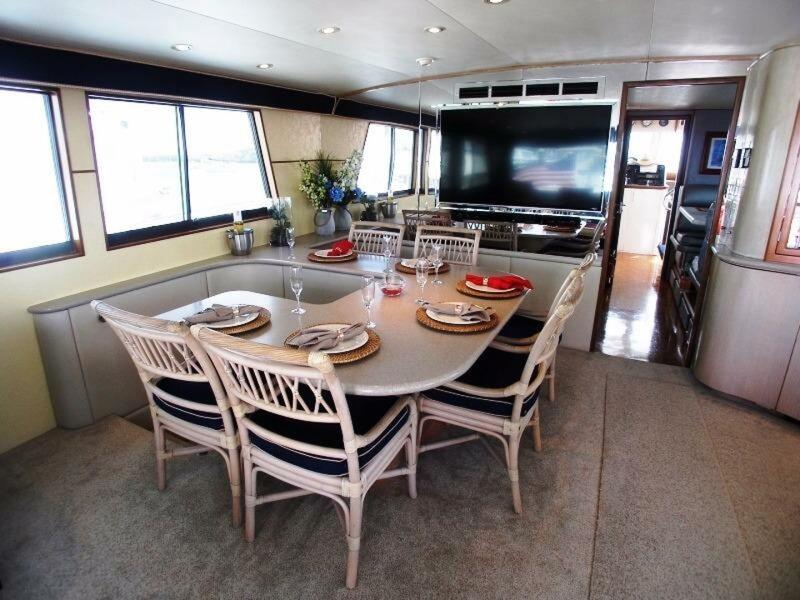 A large 52" flat-screen TV is mounted to the bulkhead just forward and across from the dining area on the starboard side is a wet-bar with liquor locker, ice-maker and stereo system housed inside the ash hardwood cabinets. 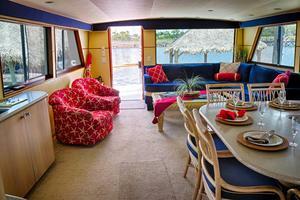 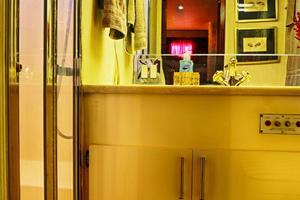 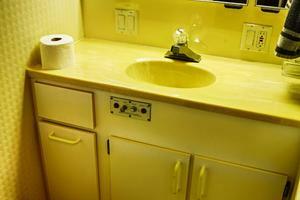 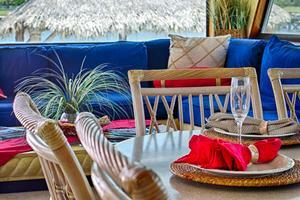 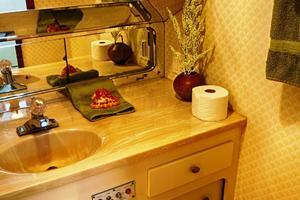 The effect of the interior decor is light and bright, conservative, tropical and airy. 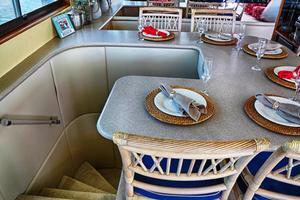 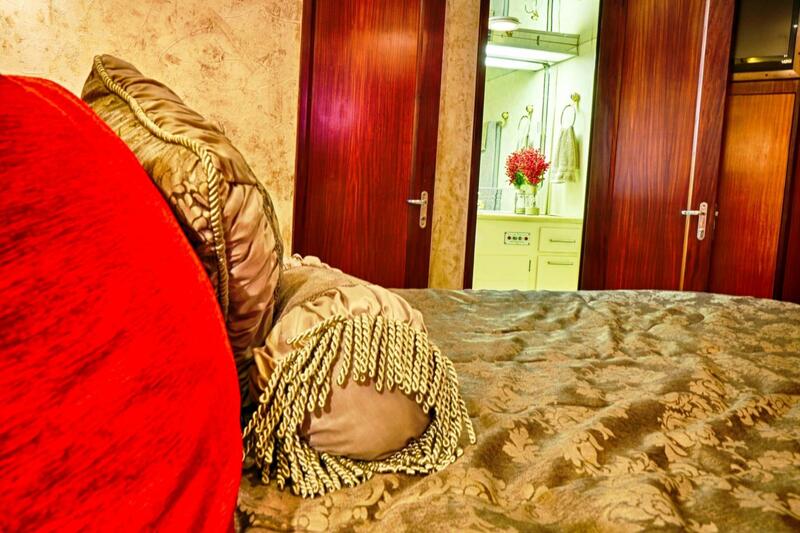 A doorway leads forward from the salon into the galley/dinette area. 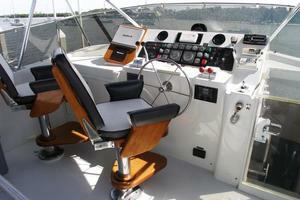 A “U”-shaped dinette is built into the starboard side and will seat two (2) to four (4) persons comfortably. 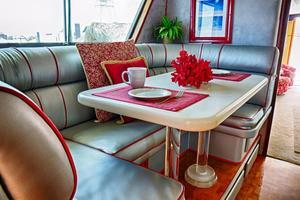 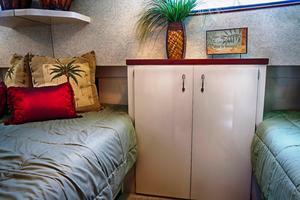 The dinette has storage built-in under the seats. 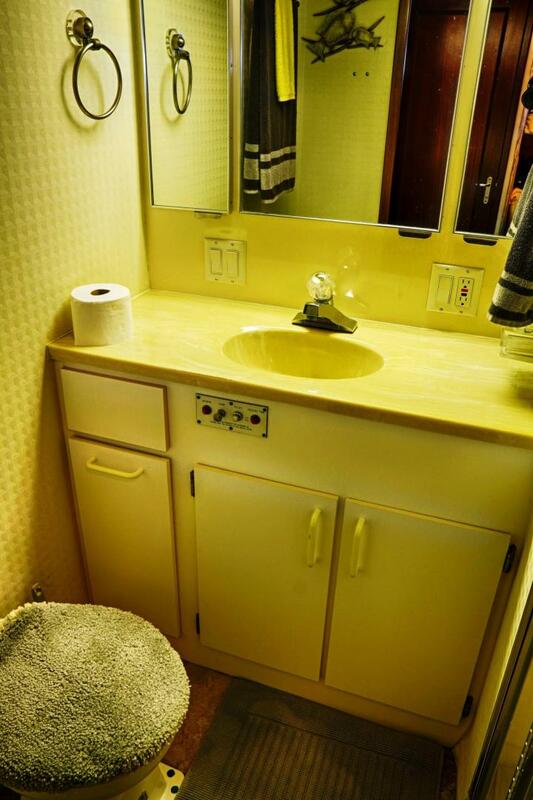 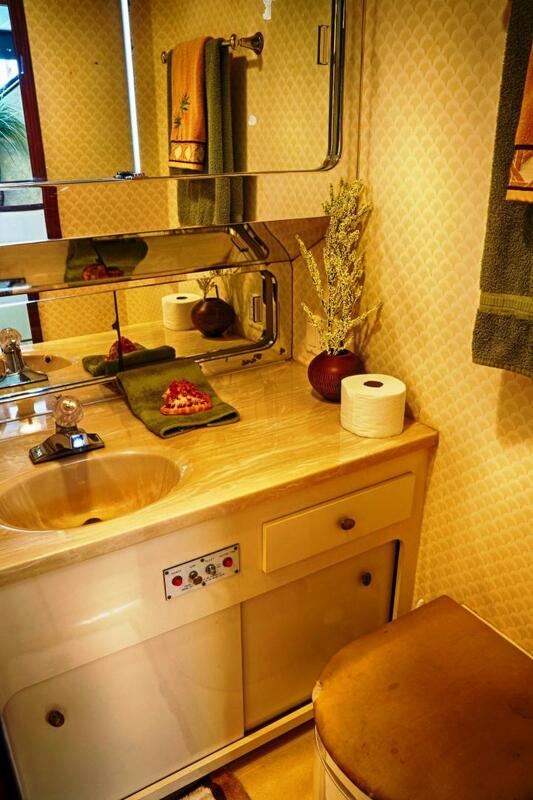 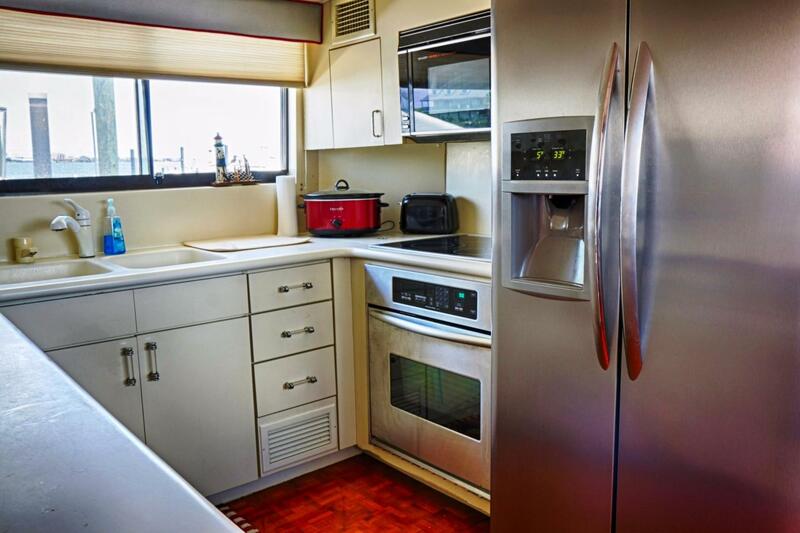 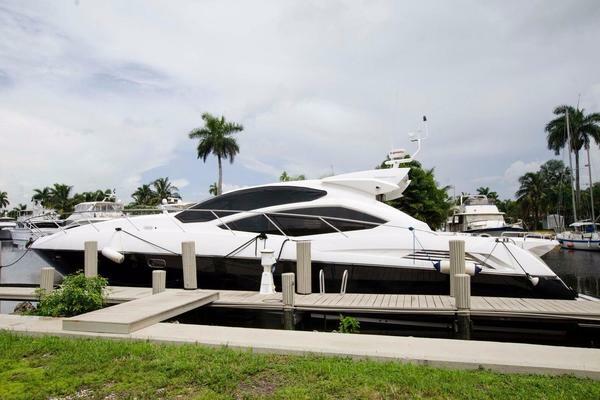 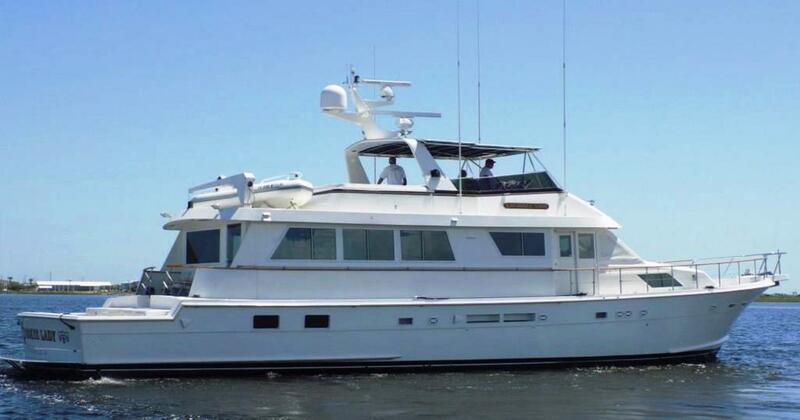 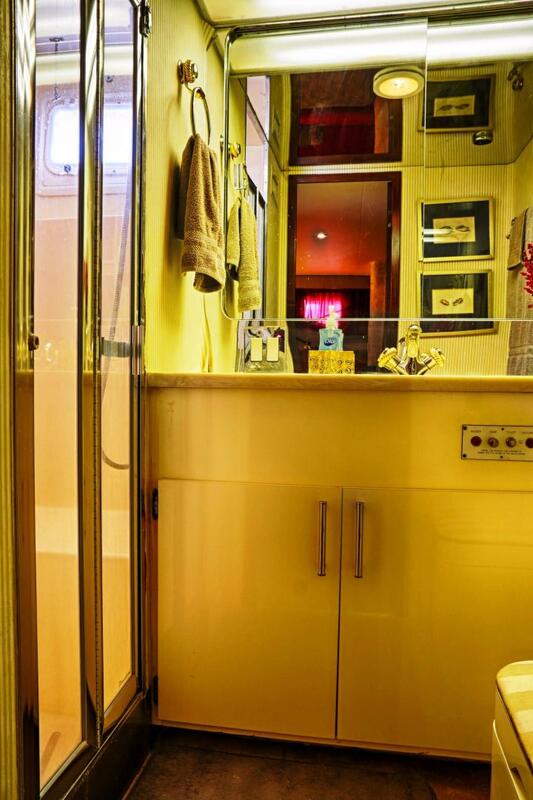 A well-equipped galley is across to the port side and features a complete set of stainless steel appliances all of which will be itemized later in this brochure. Forward from the galley/dinette area is the wheelhouse with center-line helm station, port and starboard side-doors, stairs which lead up and aft to the fly-bridge and a wide, comfortable stairway that leads forward and down to the guest’s & crew quarters. 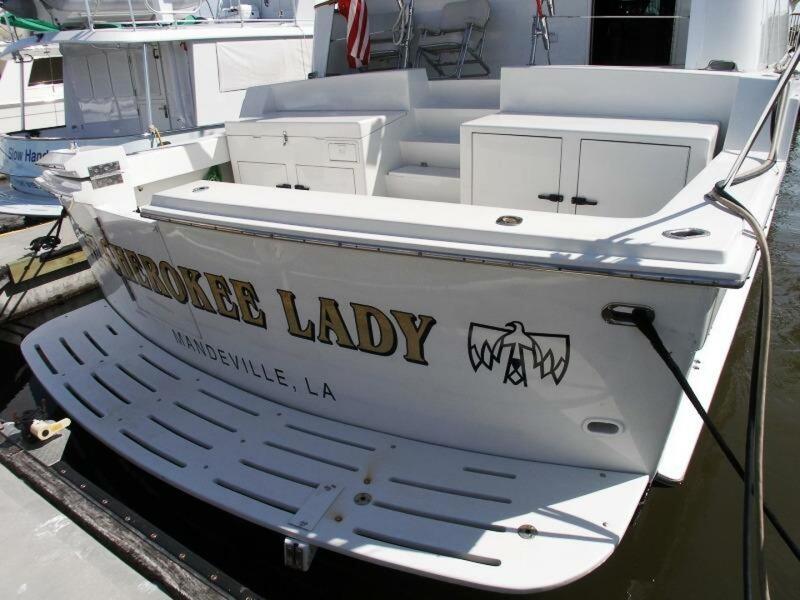 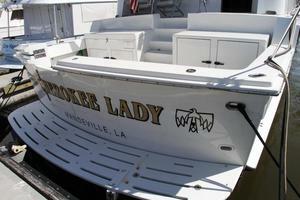 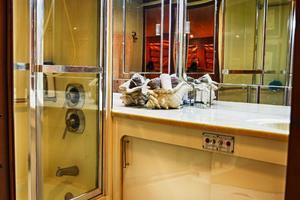 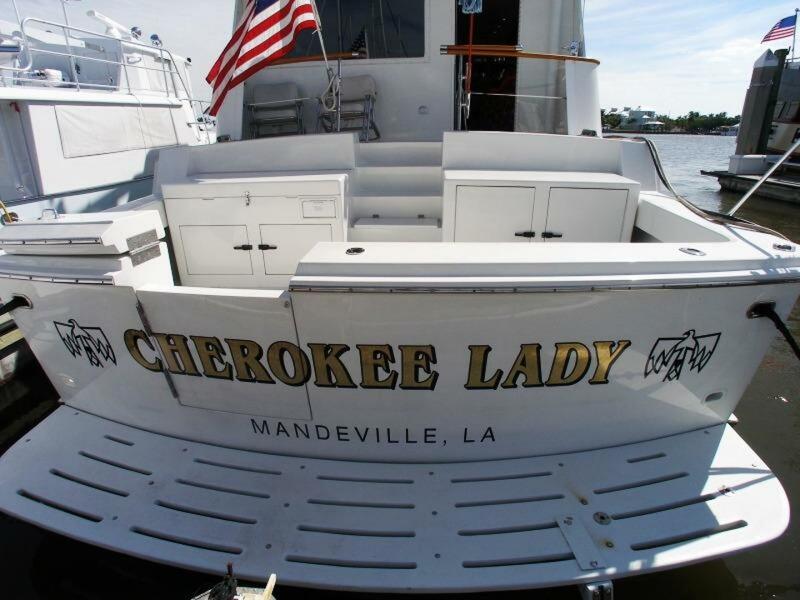 In keeping with the owner's continuing process of updating and maintaining "Cherokee Lady" to the highest standards, during April, 2017 a new 240V electric Jenn-air grill, 110V refrigerator and 110V freezer were installed in the cockpit at an expense of $6,000.00. 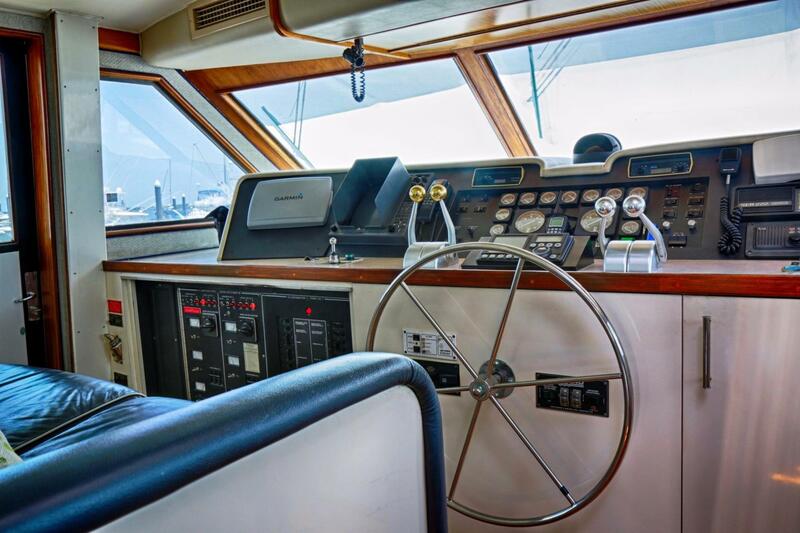 Also, the stabilizers were serviced and the windlass and bow thruster was overhauled during June, 2017. 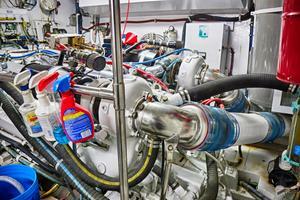 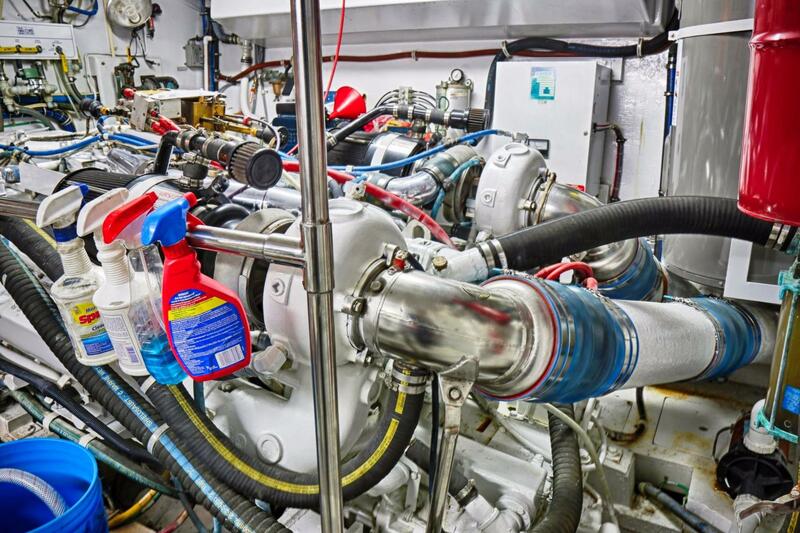 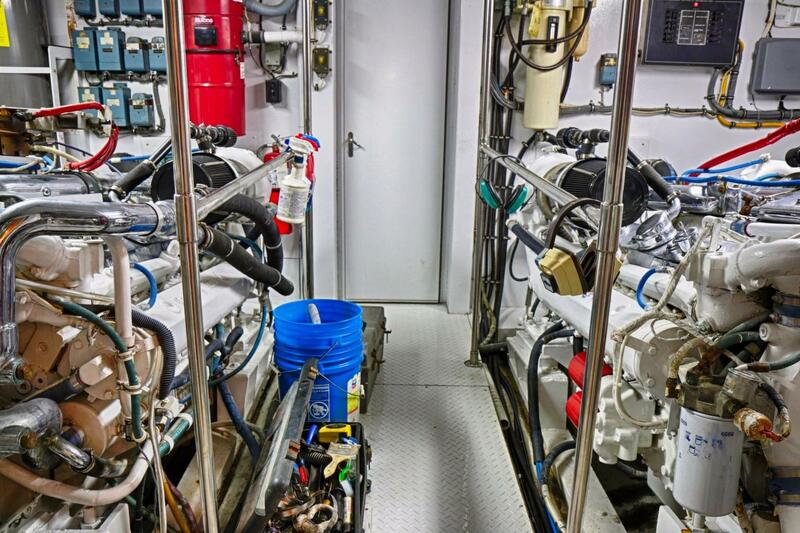 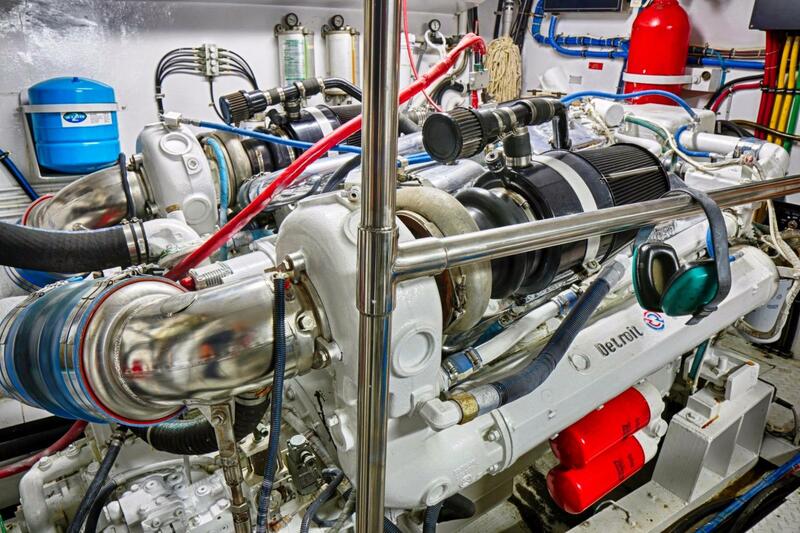 Additionally, as part of 2017 "spring maintenance," the engine oils were changed in all of the machinery aboard, impellers changed and the cooling systems in both main engines serviced.